Initial observation: We like beer, and we have done density stratified, wave-tank-style black & tans… but can we do a 3 layer beer wave tank? Expectation: With enough density contrast, we strongly believe that we can get a 3 layer system (with beer). This works very well in a typical oceanography water tank lab, where density differences are based on either temperature or salinity. Beer is no different: as long as there is a density contrast, it should work. However, we have sometimes found that finding beers that work well takes some trial and error. 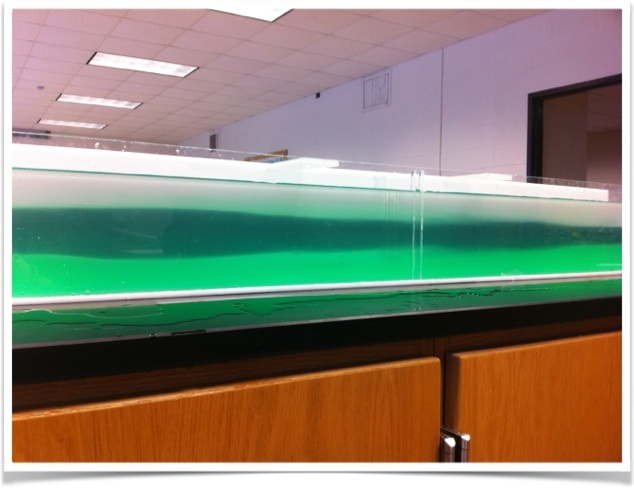 Three layers of water with different densities in a long tank. End result of a lab exercise in oceanography. Data: See the video below. While the filming did not work quite as nicely as we hoped due to poor backlighting, we did successfully get 3 distinct layers using a beer wave tank! Run 1: Video looks best when viewed with a Poppy (see equipment list)… or if your eyes know how to interpret stereoscopic images. Run 2: Here is a video (in regular 2D) of the Black and Tanwich, with a slight reordering of the beer placements. Near the end of the video you should be able to see bubbles punching through the Stone Ship Stout (dark layer) and creating little dark beer trails through the Sierra Nevada. Also, please note that the use of a Franzia box as a camera stand is pretty much all we use that for; that is not a standard wine at the Primary Testing Facility. Conclusion: The resulting flavor was nice; we have certainly had less balanced single beers before. Unfortunately lighting is an issue, as it has been in the past. We really need a strong backlight of some sort to be able to see the behavior of the different layers, especially when filmed inside. For the second run we tried having the densest beer in the middle, which may have made the system a little too complicated to get really nice layers. Also, it is really hard to get into the backyard (we wanted to utilize natural lighting) with the amount of snow we have received this year, and 10°F temps plus being calf-deep in snow makes for shaky hands. Future Questions: What is the optimal ordering of beer in the compartments in order to get distinct layers? Can better layering be achieved by asynchronous gate removal (i.e. remove one gate and let the two beers equilibrate, then remove the second gate to release the 3rd beer)? What if we adjusted the ratios of the various beers such that they were not equal (make the darkest layer smaller, and the lighter layers larger) in order to improve visual contrast?